Mountain Wood Sorel is a members of the Wood Sorel Family. It grows to 6 inches in height and has three heart-shaped leaflets connected at the point of the heart which grow to 0.75 inches in length each. It grows in open wooded and grassy areas among rocks. 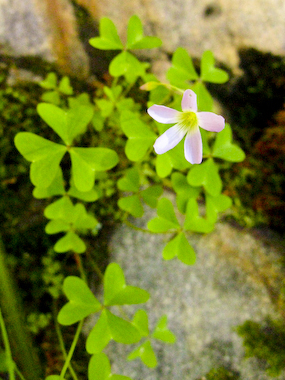 The leaves of the Mountain Wood Sorel resemble clover. 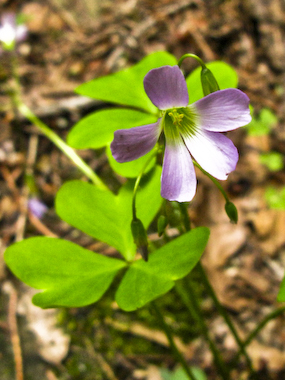 Mountain Wood Sorel blooms between March - October and produce lavender or purple flowers with 5 petals which grow to 1 inch in width and rises above the leaves on a slender stalk. Flowers are followed by a seed capsule to 0.25 inches in length.